JPMorgan Chase’s new “cryptocurrency” is turning up the heat in the blockchain arms race among the largest U.S. banks and — at a higher level — the Federal Reserve. On February 14, JPMorgan Chase generated a lot of buzz by announcing “JPM Coin,” a digital coin that clients will use to move funds instantaneously. The “stablecoin” is linked to the U.S. dollar at a 1-to-1 rate, and can only be used internally by a “small number” of JPMorgan’s institutional clients, meaning the “cryptocurrency” is hardly currency at all. 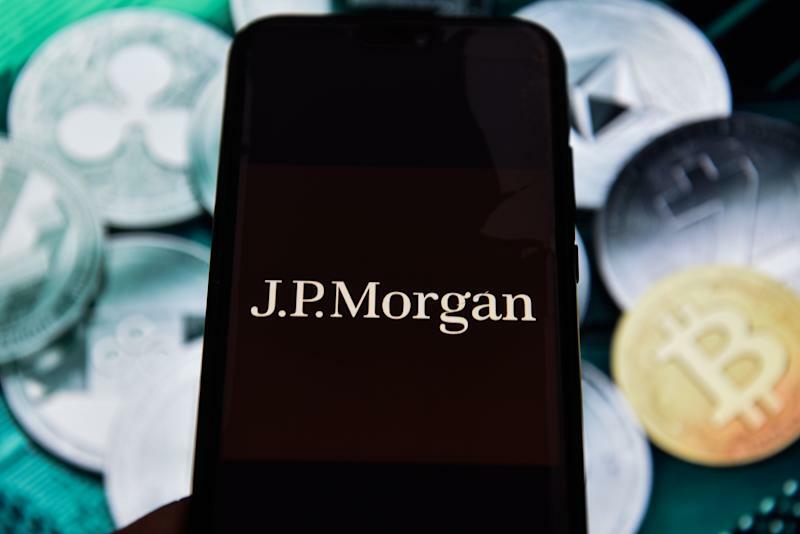 The pilot program has bigger ambitions; JPMorgan Chase (JPM) says that it could scale up its application of blockchain technology if instantaneous payments via JPM Coin prove useful. “Ultimately, we believe that JPM Coin can yield significant benefits for blockchain applications by reducing clients’ counterparty and settlement risk, decreasing capital requirements and enabling instant value transfer,” the company says. Franklin Bi, former head of JPMorgan Chase’s blockchain strategy, told Yahoo Finance that individual banks would like to have ownership of the next big blockchain tech that can “overwrite” the current payments infrastructure. For example, Goldman Sachs (GS), Bank of New York Mellon (BK), JPMorgan Chase and Northern Trust (NTRS) are all working on crypto-based custody services. Citigroup (C) has also tested blockchain technology in its Treasury and Trade Solutions business. As early as 2014, Citi experimented with “CitiCoin” to examine use cases for distributed ledger technologies. The cryptocurrency was deployed in a far more limited capacity than JPM Coin; the tech was tested in a lab and had no real money passing through the systems. Citi later pivoted to deploying blockchain technology directly with clients. In 2017, the company announced that it had collaborated with Nasdaq on blockchain technology for streamlined payment transactions. The “CitiConnect” blockchain platform has allowed clients like Nasdaq Private Market to carry out payment transactions between multiple parties in real-time. The system functions more like a bridge than a full-on blockchain ledger, since its clients need to plug their own systems (enterprise resource planning software) into Citi’s ledger for it to work. With the exception of JPMorgan Chase, banks have been mum on their research as regulators continue to work through a regulatory framework for ensuring the safety of this new technology. U.S. regulators have expressed concern about the cybersecurity of firms, and broader questions about data privacy still need to be addressed within the context of shared ledgers. The ultimate goal would be adopting blockchain at the industry level so banks can clear interbank transactions in real time. An example of the consumer-facing benefits of blockchain: transferring money faster from one bank to another. In the current system, an automated clearing house (ACH) facilitates the transfer of funds between two financial institutions. But the presence of a middleman means that payments can sometimes take two business days to process. Complicating things further, there are only two ACH operators: The Clearing House and the Federal Reserve. If JPMorgan Chase or another bank can scale up blockchain technology that is robust enough to be used for payments processing and clearing, it is possible that the private sector could spur a new challenger to The Clearing House and the Fed. The private sector has already yielded Ripple, a real-time settlement system that already processes cross-border transactions using ledger technology. John Velissarios, global blockchain lead at Accenture, told Yahoo Finance that JPMorgan Chase and the other banks will have to scale their blockchain technology beyond test coins like JPM Coin, which only have valid use cases in limited and internal applications. “You can see a model where you have multiple entities having their own sort of tokens, but that would be the equivalent of what would just be commercial paper today,” Velissarios said. Velissarios said the largest financial institutions are engaging in conversations at the national level to see if there are opportunities to coordinate on developing shared ledger technology. For its part, the Fed is already working on its own blockchain, as well. While the Fed has no interest in issuing its own digital currency, Fed Governor Lael Brainard has spearheaded efforts on improving its payments system. “Because of the transformative potential of digital currency and distributed ledger technologies, the Federal Reserve is actively monitoring digital innovations in the financial system,” Brainard said in May 2018. Franklin Bi says it will be a slow race; he predicts that the industry is still 10 to 15 years and a “tremendous effort” from a complete overhaul of the payments system.